Yes, I’m crazy. 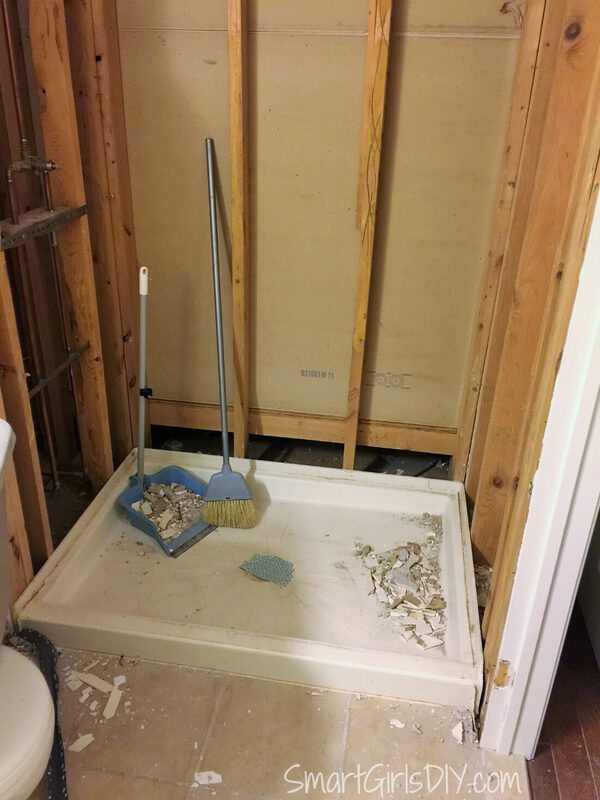 I tore apart most of my kitchen last month and haven’t even ordered new cabinets yet, but… I decided to completely remodel the downstairs bathroom while I figure out the kitchen. There are just so many flippin decisions to make! My Pinterest addiction has hit such a ridiculous level I’m embarrassed to say anymore. Well let’s just say I’m so glad I have unlimited data and I love my giant iPhone 6+. The two things together make it so easy to stalk Pinterest while watching LAX, softball, or track meets. You can follow me on Pinterest HERE. Anyway… I had a couple plumbers over last week and everyone agreed I should replace the bathtub in the kids bathroom while I had the ceiling open in the kitchen. You can actually see the current bathtub from the kitchen after we took the soffit down. Ok, so replacing the tub is reasonable. right? Of course! I’ve wanted to tear out that nasty blue original 1980’s tub since the first time I laid eyes on it. So I went ahead and ordered this Kohler bathtub and drain assembly. Yay!! That’s one decision down! And I exercised restraint and haven’t torn out the old bathtub just yet. 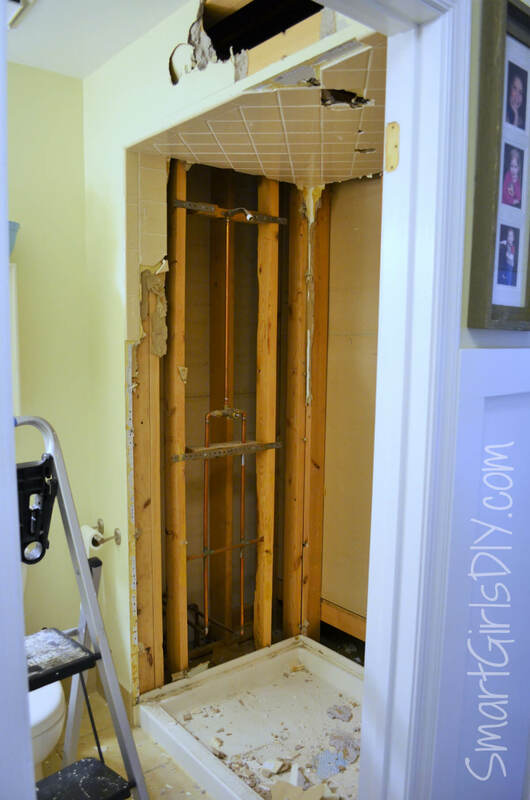 The kids are probably going to want to shower a few times before I can get a new tub in there and completely re-tile the walls and floor, and I surely don’t want all 3 of them using MY shower. No thank you. So I decided to find them another place to shower… in the guest bathroom. We are fortunate enough to have a 3rd full bathroom downstairs, but UNfortunately the shower has been broken for a quite awhile. The valve stopped working (after about 32 years) which stinks because that’s the part that is hidden behind the tiled wall. Way back in October (during the hubby cut a pipe in the wall incident) I had a plumber look at the shower and he said he would have to take out some of the tile to fix it, then put ugly metal “wings” on the wall to cover the missing tile. Hmm let me think about that one… NO! Well he didn’t say ugly, but that’s what he meant. 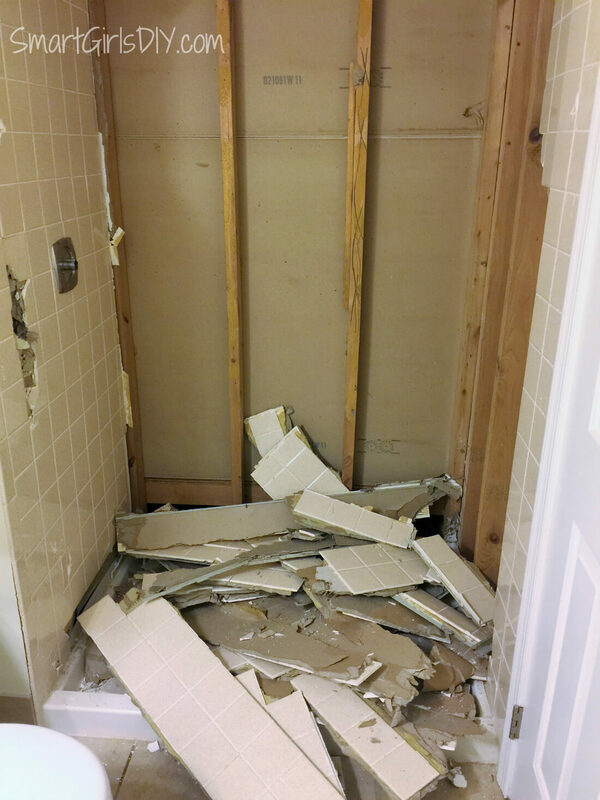 So in my defense, the shower didn’t work anyway, and I was perfectly justified in tearing it out down to the studs in the middle of a kitchen renovation. Right!? It might seem like spur of the moment, but I’ve really been putting it off since October. 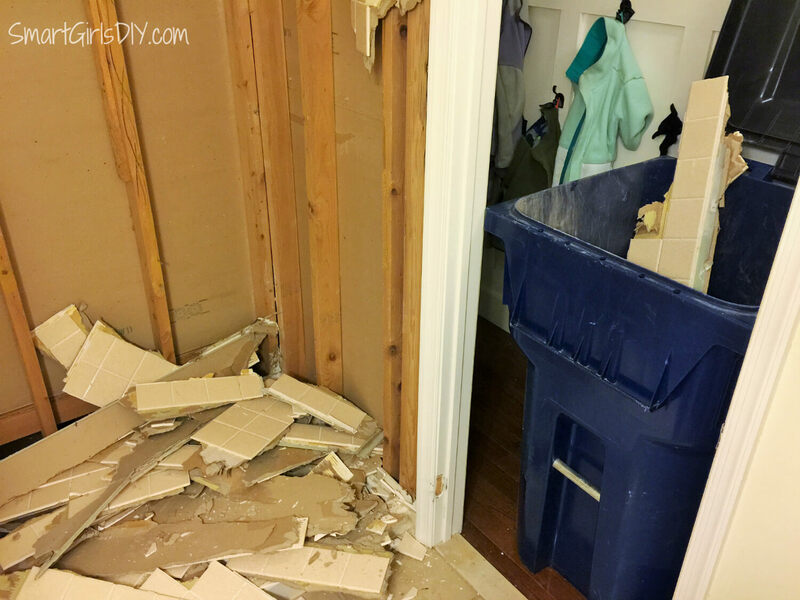 And this is just the motivation I needed… keeping the kids out of my bathroom (which needs to be remodeled one day too) while their bathroom is being redone. Don’t worry, I’ll have this shower working in no time. 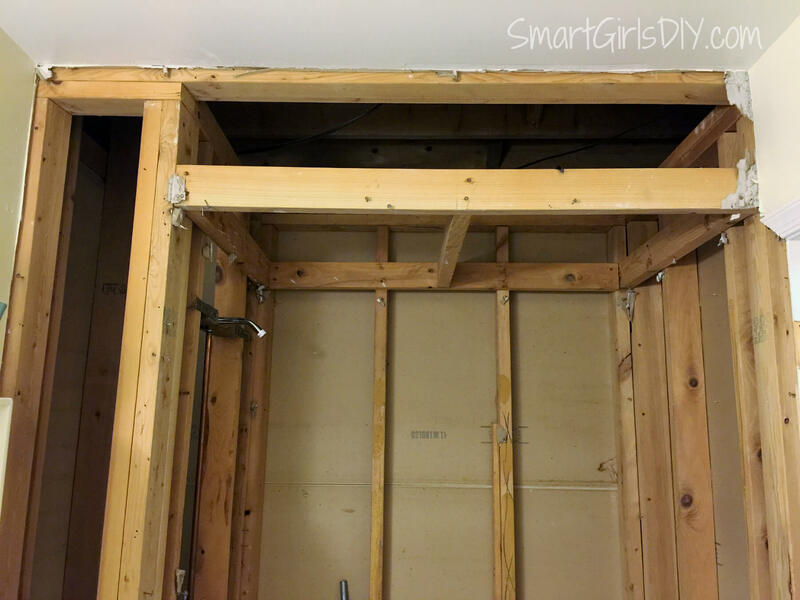 Build your own shower pan – this takes longer, has more chance for leaks, but costs a lot less. Plus it’s completely customizable. As I said I am still undecided. But enough with the rebuilding — let’s get to the demo!!! I took the walls out first. They came out rather quickly because the tile was just glued to regular drywall. It came out in big pieces. And small pieces. I taped the drain hole over with duct tape so stuff wouldn’t go down it. 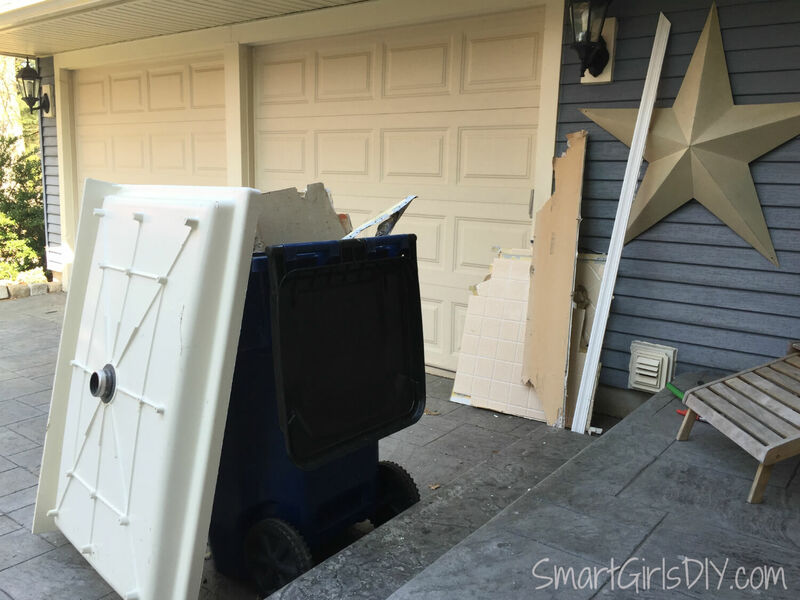 I also thought I’d be really smart and bring our giant trash can into the house and put it right outside the bathroom to make clean up easier. That was a great idea until it came time to getting the thing back outside. It’s currently sitting in my laundry room waiting for hubby to return from his business trip tonight. Yup, that’s right, my husband has not been home for any of this demo process. If I were him I would certainly think twice about going away without hiding the sledgehammer first. A few friends on my Facebook page were interested in the demo process, but there’s not a ton to say about this part. I hit the tile with a sledgehammer whilst wearing shoes (not flip-flops) and safety glasses. I did take the bathroom door off its hinges to make more room. It’s hanging out in my office for now. I’d really like to put in a pocket door, but I’m having a hard time figuring out where to move the light switch. When the tile came down on the wall with the shower head I was shocked to find nothing behind it. Well not nothing, because the pipes for the shower were there, but they had been extended a foot forward, making the shower a foot smaller. FOR.NO.REASON. And people I even conferred with a plumber on this one! The pipes come out of the ground (no really, it’s a concrete slab in this part of the house) in the wall between the bathroom and family room and there’s no reason for the 1′ bump out. Boom! My shower just went from 4′ wide to 5′ wide. Yeah baby! But wait… there’s more… Upon removing the tile from the ceiling (yup you read that right) I discovered NOTHING in the 1′ drop down. Wtf? We’ve had a cave-like shower all these years for no reason. There is a whole lotta nothing above the shower. No plumbing, electrical, HVAC, nadda. Someone chose to build a 2×4 frame and lower the already low ceiling another foot. I don’t get it. But whatever, it’s all coming out. More good news is that I we (meaning the professional electrician and plumber) can easily add a shower light and ceiling mounted rain shower head (something like this, but my friend Cindy gave me a 12″ shower head for FREE). So that will be awesome! 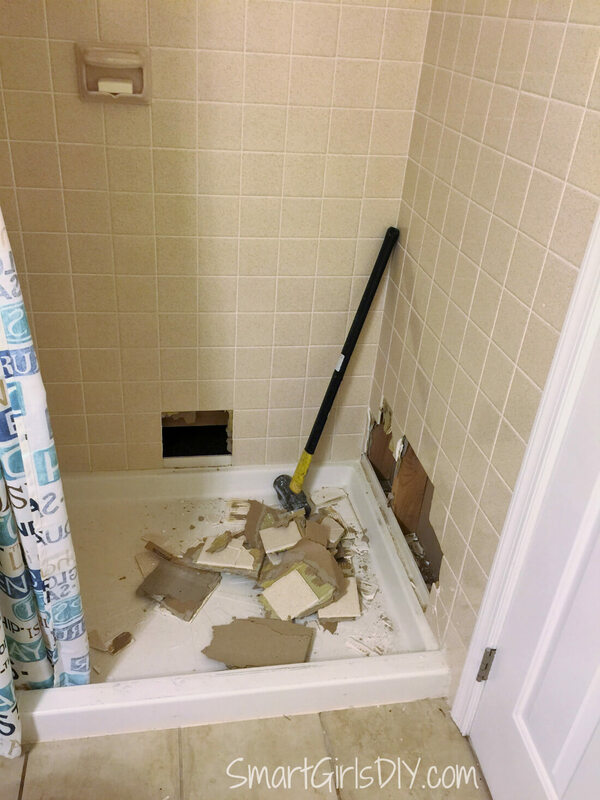 The hardest part of the demo was removing the shower pan. I did my due diligence and watched this YouTube video first. Then I got to work. Well I had to clean up a bit first. I swept and shopvacced the shower pan so little pieces of debris wouldn’t go down the drain. I ended up eventually sticking a rag in down the hole too because little rubber pieces of the flange were getting everywhere. Remove any nails holding the pan in place. My shower pan had nails in every stud holding it down. The nails didn’t actually go through the pan, but over it, keeping it wedge in place. I had one nail that didn’t want to come out, so I just whacked that area with my sledgehammer and it broke off enough of the pan to free it. Drill into the black rubber flange. Over and over. But avoid drilling into the drain pipe! Use a razor blade to try to cut the flange loose from the drain pipe. Vacuum up all the little bits of rubber flange so they don’t go down the drain. Also cut the seal between the outside edge of the shower pan and the floor. 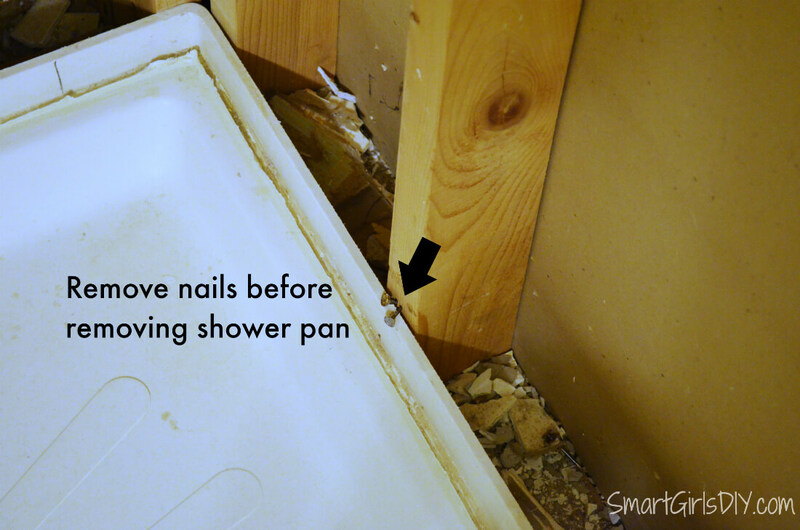 Or tap the edge of the shower pan with a sledgehammer a few times to loosen it from the adjoining tile (like I did). 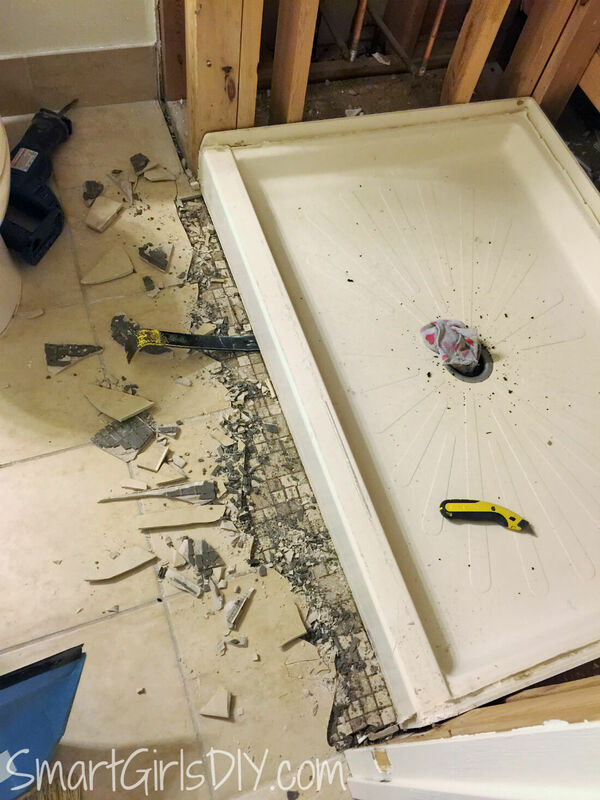 I also ended up taking out the tile next to the tub so I could really get the crowbar underneath the pan. To my surprise there was two layers of tile. Bummer for me! 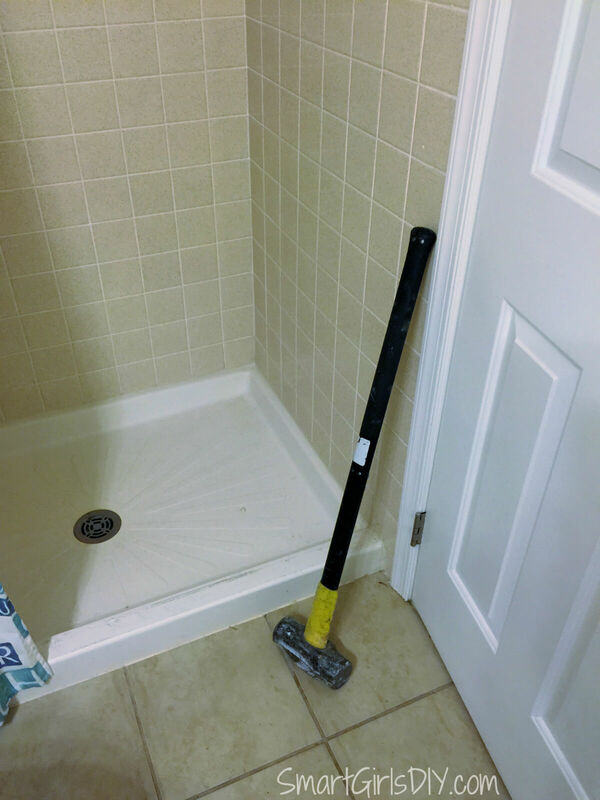 Pry the shower pan up on as many sides as you can reach with your crowbar. 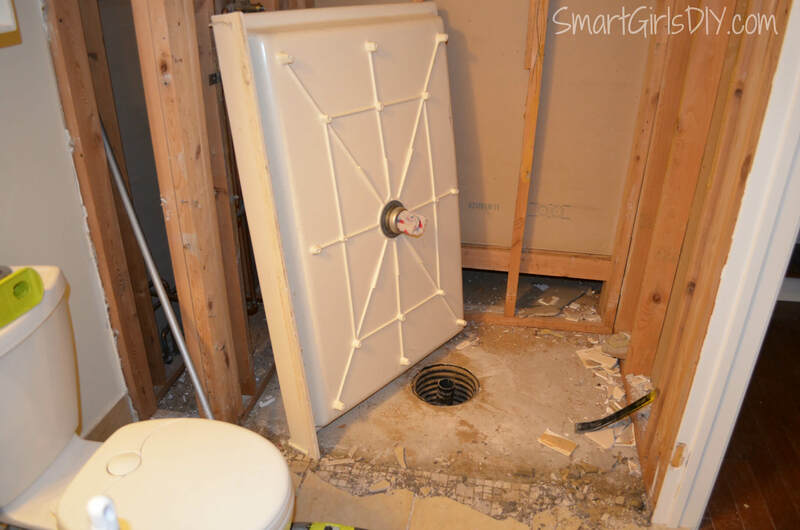 Pull on that bad boy with dear life, but keep an eye on the drain — you want to make sure you’re only pulling the flange up with the pan and that you are NOT pulling on the drain pipe. 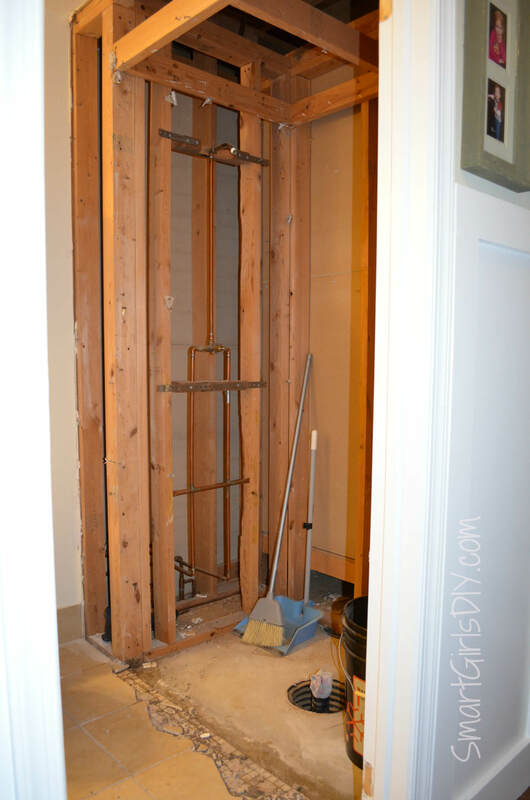 Renovating the guest bathroom is one of the best ways to impress your boss when you invite him to dinner! Thanks for writing. I am sooooo glad you watermarked your pictures! 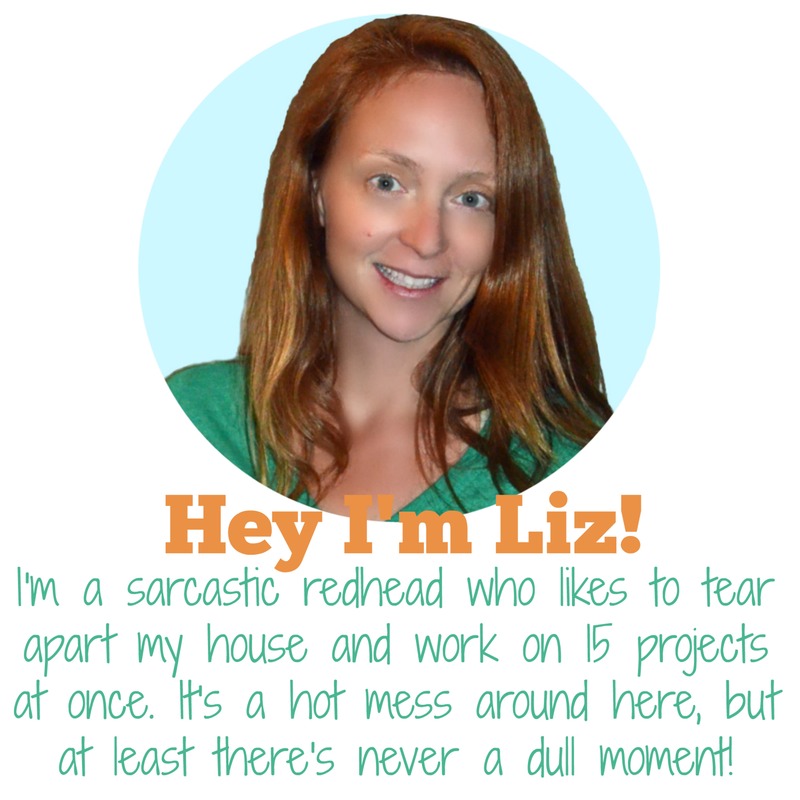 I saw one of the pictures on this page on a website that had a bunch of remodels and if it hadn’t been for that watermark, I would never have found your blog. I have been looking for anything online that showed what the slab is supposed to look like before starting our project. I know the concrete people didn’t do the slab right but I couldn’t find anything that showed what a shower looked like before the pan was put in. One of the shower contractors tried to explain over the phone why we needed to break out the concrete around the drain pipe, but it didn’t make sense until I saw your photo. Thank you, thank you!